From its inception as a scrap heap in 1907 to the more familiar and stack of vertical logs, the Fightin’ Texas Aggie Bonfire symbolized every Aggie’s “burning desire” to beat the University of Texas in football. Attracting between 30,000 and 70,000 people each year to watch it burn, Bonfire became a symbol of the deep and unique camaraderie that is the Aggie Spirit. Bonfire burned each year through 1998, with the exception of 1963. That year Bonfire was built but torn down in a tribute to President John F. Kennedy who was assassinated on Nov. 22, 1963. The second time in A&M’s history that Bonfire did not burn was almost exactly 92 years after the first Bonfire due to its collapse on Nov. 18, 1999 at 2:42 a.m. The collapse claimed the lives of 12 Aggies and injured 27 others. Five years later, the Bonfire Memorial was dedicated on the exact location of the fallen 1999 Bonfire. The Bonfire Memorial embodies many layers of meaning associated with the Aggie Spirit — a deep sense of belonging, a strong spirit of teamwork, and leadership and an enduring sense of tradition that unites thousands. The Bonfire Memorial celebrates the tradition, history, and spirit of Texas A&M and the dedication of those involved in the tragic collapse of the 1999 Bonfire. Uniting Aggies past, present and future, the Memorial is comprised of three design elements: The Tradition Plaza marks the entrance to the memorial and reflects on the activities that bring Aggies together. Spirit Wall separates the outer world from the intimate experience of the memorial, while the Last Corps Trip Wall recites the poem traditionally read prior to the lighting of Bonfire each year. Texas A&M University presents a video tribute to the ten-year anniversary of the Bonfire tragedy. This video was shown at the Bonfire Remembrance Program held on campus on November 17, 2009. 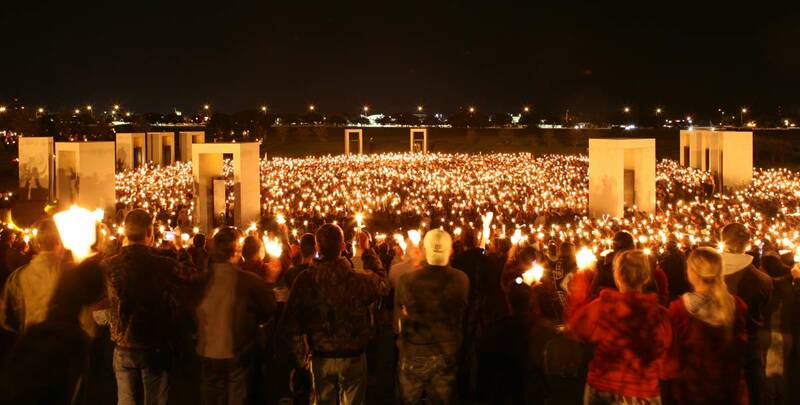 The Aggie family came together to remember the 1999 Bonfire tragedy and the 12 Fallen Aggies.